A speccy port!!! There is a lot of homebrew examples where you can see that CPC was really a very advanced machine with a powerful VDP, but this VDP never was used, CPC was programed as a simple Z80 machine (like Speccy). Not the best example as the commercial release use colour quite well. There are a lot of Spectrum ports that do a very much worse. Does that mean that the ink is changed after a specific scanline of part section of the screen is drawn? In that way it is possible to have more colours visible than would otherwise be possible? this means that in some games, the use of rasters has to be limited to the sections on the screen where the main sprites don't cross between rasters or we will have a "color clash" party!! CPC is a great machine! Unfortunately C64 users think that its machine was better, but simply C64 didn't have Speccy ports and had specially designed software. Honestly, all three are great machines in their own ways and each has certain limitations where it tends to fall down. 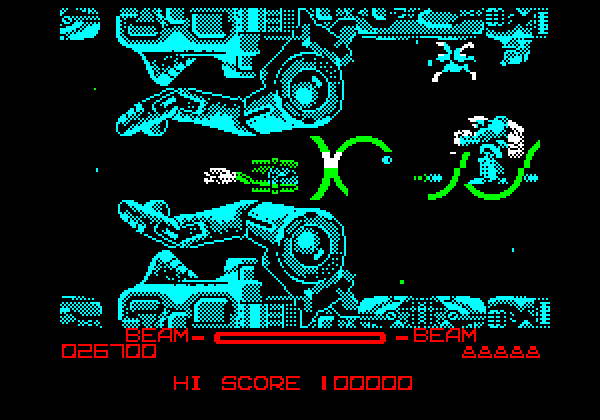 I think that R-Type 128 shows off how much the CPC benefits from having extra RAM available, the breathing room it gives a developer over the 64K config can really make all the difference. You have to wonder whether the machine might have had more success if it had started off with the extra RAM in it, so that developers weren't tied to that base limitation quite so much. Compared to CPC, Speccy and C64 were lucky since they had specially designed software. I mean, CPC couldn't show it's real capabilities, the other 2 could. the Amstrad is able to do things that even the Amiga can't do (it's a planar machine). the Amiga with the copper can apply colors on specific area of a screen, and that's it. Strider 2 is one of them. I tried to make the maps of this game, and it's not possible to do due to the use of rasters. Very interesting this, could you explain it a bit more? Always wonder why the "all importent for business" mode 2 was used so little on the amstrad. The 80 columns being compatible-ish with IBM, terminal systems & the rest of the "serious business" machines i always wondered why so little business software was made for it. I mean i know the c64 had hardware dongles to give them 80 column modes as well so they knew it was importent. The Amstrad having it natively it oddly never really "took off". Yay! I became a 6128. Hope it wraps .. I am sorry to disagree strongly, but this sounds like fellow OAS, who for years insisted that neither the C64 nor the Amiga had better musical capabilities just for the sheer fact that the CPC could basically play the same tunes. He completely failed to understand (and maybe even recognize) the different qualities of sound and how sound can make a song - ehm - sound different, richer, more appealing to our "hearing system". Melody =! sound in particular. And with statements like this you foment the out-of-time platform wars. The Copper, and the Amiga chipset, are extremely clever things. The Copper is really just a simple fixed function hardware running a copperlist (simple program) that performs chipset register updating. It has access to all the chipset registers (on different chips). The obvious example is changing the colour registers (which IIRC it can do every 8 or 16 pixels), but it can also update sprite registers (see games with repeating background sprites like Risky Woods), and others. So you would use the CPU to write a copperlist every frame, and that's how you got copperbar effects that move, and so on. I have added some elements to simulate a Mario style game with pixel precise scroll. I think it can be done at 50 fps (test attached, use cursor to move). In this test some things are missing, like sound and scoreboard, but I think there's time for that, and it is possible to save speed by optimizing things like compiling tiles. Alternatively, it is also possible to save CPU by using byte precision instead of pixel precision for the scroll (it could use the stack to draw sprites and tiles then, and save memory from sprites). After all the buffers and screen areas, there are about 24kb free in the first 64kb of ram, so simple games for 64kb are also feasible with this "engine". This is madness! So smooth! The inertia on the scroll is particularly cool. Wow, amazing. Smooth, great collision detection and fast scroll. I hope the experts are able to take advantage of this new engine and produce some sweet games. This is crazy smooth and in overscan width too! I have a project that could make good use of this if you ever wanted to make a game with graphics I've done. Rhino's code + Carnivius' graphics = match made in heaven! Decent inertia could make for a good Uridium style game, if the engine can change directions. And yes, definitely do that! Includes a nice video for those of us who haven't been able to run it on the real thing or emulator. Impressive. I was going to post the news too!!! Page created in 0.251 seconds with 104 queries.